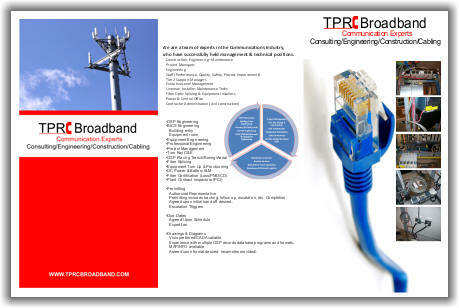 TPRC Broadband designs and builds networks for communication companies. TPRC Broadband is a service vendor to telecommunications companies and business users. We are engaged in the installation of telecommunications equipment, fiber optic cable splicing, testing and service turn-up. We provide building entrance and long-haul route planning services for our client companies consisting of field note capture, route drawings, permit procurement and coordination with construction contractors. TPRC Broadband is a Fiber and Data Services company with an emphasis on service. Our mission is to provide the highest workmanship and quality to existing and new customers in the communications industry. TPRC Broadband thrives on quality assurance, we feel that this is the key to our success. We do this through ongoing training, vigorous quality inspections and safety standards. We also provide our customers a two-hour commitment on outage calls and to date have met or exceeded our customer expectations. Our people are highly qualified, motivated, and knowledgeable.